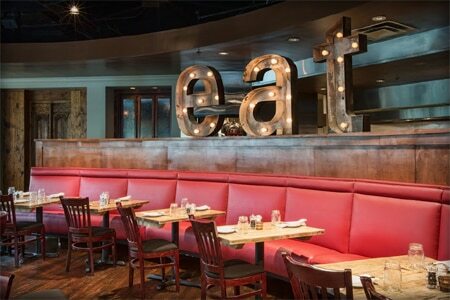 Southern-influenced American fare finds a home in this comfortable, breezy atmosphere. : Suggesting the aesthetics of a 1920s speakeasy, Food 101's décor relies on dark-stained wood flooring, a wood bar, brick wall tile and leaded glass. Native South Georgian Justin Keith set the tone for the modernized but classic Southern food that has been the restaurant’s hallmark since its opening. Longtime Atlanta chef Ryan Smith took over from Keith but has gone on to other endeavors, leaving Linda Harrell, who also helms the company's Cibo e Beve at the opposite end of this strip center, in command. We suggest the grilled oysters, topped with cornbread crumbs and presented with a duo of gently charred lemon halves. Other dishes we've enjoyed include the ever-popular meatloaf and the fried chicken using Springer Mountain chicken. Target the bourbon pecan pie or any of the fruit-based treats for dessert. Wine drinkers will find numerous good selections by the glass, and bottle prices offer very fair values, although we lament the loss of the Wolf Mountain wines on the list. The bar has its own tapas-style menu.